We certainly got a buzz upon discovering the latest sequels to a few of our favourite picture books. Still highly capable of capturing our hearts and imaginations, just like their predecessors, these titles don’t disappoint. From forming new friendships to rekindling old ones, from commencing inspiring adventures to revisiting good old-fashioned traditions, preschoolers and early primary aged children will delight in every part of the wonderful journeys these books will take them. Snail and Turtle Rainy Days, Stephen Michael King (author, illus. ), Scholastic Press, 2016. With the same warm and playful narrative and animated illustrations as in the original Snail and Turtle are Friends, King beautifully compliments this sequel with an equally gentle and humbling innocence in its tone. Once again, King has successfully alllured his readers with a tactile, blithe and innovative experience. 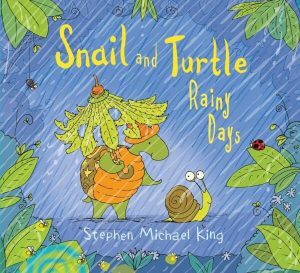 Snail and Turtle Rainy Days is a creative and heartwarming tale about going to assiduous measures to help out a friend in need. I also love the undertone that Turtle might possibly be doing so to satisfy his own little pleasures in life! However, children from age three will absolutely soak up these busy characters and adorable qualities in this sunny story set in the rain. See my full review here. I Don’t Want to Go to Bed, David Cornish (author, illus. ), Angus & Robertson, 2016. Immediately following on from its prequel comes the opening line, “Every night when dinner was done, Rollo would cry ‘I Don’t Want To Go To Bed!‘”. 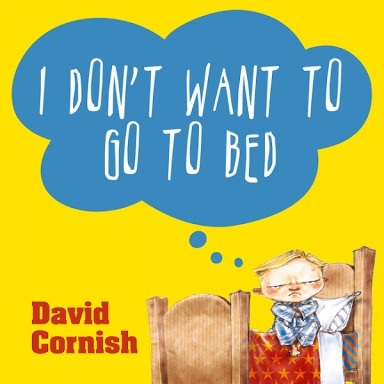 Cleverly written and hilariously illustrated by David Cornish, this next title in the series certainly ticks all the stubborn-child-mastering-routines boxes. In this short and sweet tale, Rollo attempts every excuse under the sun to avoid going to bed. Fortunately, with a little imagination (and perhaps some imperceivable parent influence) Rollo can check off his ‘story, food, water, toilet and monster’ checklist. Is he finally ready for bed? Bold, vibrant and loud, and exhaustingly true, preschoolers and their parents will both cringe and delight in the arduous strategies determining when and how they will go to bed. 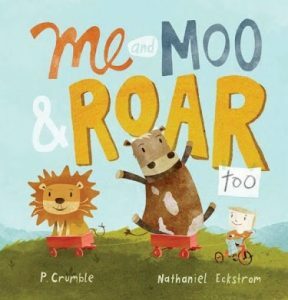 Me and Moo & Roar Too, P. Crumble (author), Nathaniel Eckstrom (illus. ), Scholastic Australia, 2016. When Me and Moo first made its grand entrance we were udderly – oops, utterly – delighted by this comical tale of friendship between a boy and his mischievous cow companion. Now, roaring onto the scene is their newest comrade, surprisingly delivered straight from the zoo; Roar. In Me and Moo & Roar Too, it is Me and Moo’s quest to return Roar back to his home-away-from-home after he causes chaos in their house. Although this might be disheartening for readers, they will be reassured to know that every animal is happy in their place of belonging, and that Me and Moo may just encounter yet another wild pet adventure any time soon! With its child-friendly narrative voice and gorgeously textured and discernibly witty illustrations, this sequel perfectly compliments the first and will have its preschool-aged readers roaring for more. 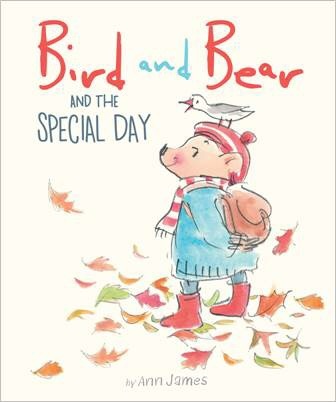 Bird and Bear and the Special Day, Ann James (author, illus. ), The Five Mile Press, 2016. In a story of discovering the beauty and nuances of the world around them, Bird and Bear explore nature, science and their close relationship. When they meet again in Bird and Bear and the Special Day, Bird, on her ‘Birdday’ enchants her friend Bear with a series of ‘Eye-Spy’-esque challenges as they take a stroll through the park. James’ winsome dialogue cleverly integrates concepts of prepositions, opposites and scientific observations, as well as the pressing problem of whether Bear will remember Bird’s Birdday. Watercolours, pencil and pastel tones perfectly suit the whimsical yet tranquil adventure walk and the gentle, harmonious friendship between the characters. A joyous exploration of words and the outdoors, imagination and strengthening bonds, this series has the magic of childhood autonomy at its forefront. Recommended for children aged three and up. 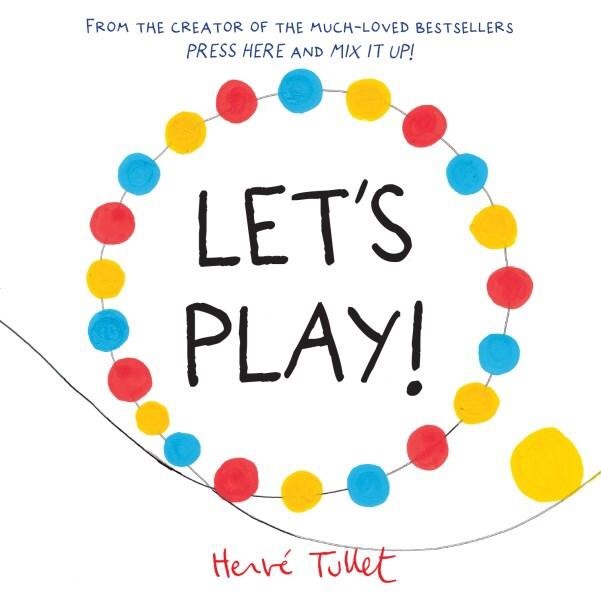 Let’s Play!, Hervé Tullet (author, illus. ), Allen & Unwin, 2016. Originally published by Bayard Editions as ‘On Joue?’, 2016. 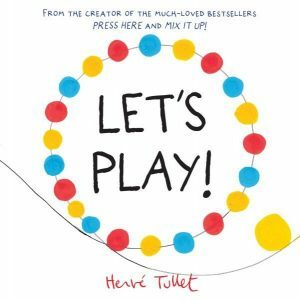 A brilliant companion to the best-selling books, Press Here and Mix It Up!, pushing boundaries and exciting creative imaginations is the latest by Hervé Tullet; it’s Let’s Play! A genius masterstroke by the artist, engaging readers in a vibrant sensory, kinaesthetic and all-round enjoyable interactive experience. Instructing its willing participants to join in, the yellow dot pulls us on its journey along, up, down, round and round a simple black line from start to end. With the dot we encounter more dots in primary colours, play games of hide-and-seek, face ominous dark tunnels and black, messy splashes and scribbles, until we finally reach the safety of clean pages and fairy-light-inspired canvases. Children and adults alike will delight in this gigglicious, playful adventure exploring shape, colour, space and line with its subtly thrilling storyline to tempt your curiosity many times ’round.